To change things up, this blog post will focus more on the social aspects of cancer rather than the molecular basis of the disease. Specifically, I want to discuss the consumption of red meat and the growing body of evidence linking it to cancer. So at the beginning of class, Dr. Islas tried to convince us to make lifestyle changes that would reduce our risk of developing cancer. He suggested that we always wear long sleeve shirts and pants (especially during the summer!) and especially for us to avoid eating meats that were BBQed. I am guessing that many of you, even with ten weeks of cancer biology under your belts, are not going to make such drastic lifestyle changes. Odds are we will continue to wear our swimsuits and we will probably continue to eat meat. All of this made me wonder about our threshold for behavioral trade-offs. In other words, how high must the risk for cancer be before we make dramatic changes in the way we live? For many of us, we are willing to tan outside, but are unwilling to even venture into a tanning booth. But what about changes in our diet? One major difference between tanning and diet is that how we eat has generally been indoctrinated in us from a very young age. As a result, changing eating habits can be much more difficult. For those of us that have always been told that eating fatty foods such as McDonald's or KFC is unhealthy, avoiding fast food isn't hard. But this is normally the case with red meat. Based on my personal experience and other anecdotal evidence, a majority of individuals believe that meat is a healthy part of diet. There is the belief that red meat is the best source of protein. Although I know it is unlikely, my hope is to persuade some of you to reduce your consumption of red meat. It may not be easy, but research is showing over and over again that carcinogenic effects of red meat. A few months ago, the NYTimes published on article on a study on consumption of red meat. Researchers tracked the eating habits and health of over 120,000 individuals between 1980 and 2008 and found staggering results. After controlling for variables, the researchers found that "each daily increase of three ounces of red meat was associated with a 12 percent greater risk of dying over all, including.... a 10 percent greater risk of cancer death (1)." Risks linked to processed meats such as bacon were even more dramatic. Individuals that consumed processed meats had a 20 percent greater risk of dying overall and a 16 percent greater risk of cancer death. Despite the thoroughness of this study, the results received relatively little media attention. Even when I told my friends about the study, many dismissed it and held onto their habits of consuming red meat daily. We are pouring billions of dollars into cancer research when perhaps the best solution may be much simpler: Reduce our consumption of red meat. In the past 10 years, dozens of epidemiological studies have shown "that frequent consumption of well-done cooked meats...can result in elevated risks for colon, prostate, and mammary cancers (2)." Although the evidence against meat consumption is staggering, the largest obstacle for public health is persuading individuals to make lifestyle changes that they have been practicing for decades. So what exactly about red meat is so bad for our health? Is it the meat itself, or is it the way it is cooked? Could those charred areas of your steak really be that bad for you? It turns out that red meat isn't necessarily unhealthy. Rather, it is the method in which we cook our meats that produces carcinogens. Specifically, when we cook our meats at high temperature (frying, broiling, grilling), heterocyclic aromatic amines (HAA) are produced. "HAAs are some of most potent mutagens detected using the Ames/salmonella tests and have been clearly shown to induce tumors in experimental animal models"(3). HAAs gain their carcinogenic reputation by covalently bonding to DNA, forming DNA adducts. If an adduct is on a gene, it can reduce that particular genes expression. If the adduct sits before a gene, it has the potential to promote overexpression of the gene. The implications of adducts are dramatic especially if the genes are either tumor suppressing genes or oncogenes. HAA adducts have been detected in human tissues, showing that DNA adducts can generate genetic damage even though concentrations of such compounds in meats can be as low as parts per billion (2). It is not surprising that the NYTimes study saw such a greater risk for death in individuals who only had 3 ounces of meat. For those of you who are skeptical of studies linking meat to higher incidences of cancer, I will now go into detail about the NYTimes study. The study is broad and includes correlation between red meat and diseases such as cardiovascular disease and diabetes in addition to cancer. 37,698 men and 83,644 women were followed from 1980-2008 that were free from cardiovascular disease and cancer at baseline. Their diets were assessed using food frequency questionnaires that were updated every 4 years. Ascertainment of death was made after review by physicians and were also based on medical records and death certificates. During statistical analysis, researchers controlled for age, body mass index, race, smoking status, alcohol intake, physical activity level, multivitamin use, aspirin use, and family history of diabetes, heart attack and/or cancer. To assess the risk of red meat consumption, researchers developed a statistical model that calculated hazard ratio. A hazard ratio (HR) of 1.0 meant that there was no affect seem a specific type of food. Greater than 1.0 indicated risk and less the 1.0 indicated reduction in risk for disease. day increase was 1.13 (1.07-1.20) for unprocessed red meat and 1.20 (1.15-1.24) for processed red meat. The corresponding HRs were 1.10 (1.06-1.14) and 1.16 (1.09-1.23) for cancer mortality (4)." In particular, bacon and hot dogs were correlated with higher risk than other food items. The researchers also looked at individuals that did not consume red meat as their primary source of protein. They estimated that substituting 1 serving of red meat per day with 1 serving per day of other foods (including fish, poultry, nuts, legumes, low-fat dairy,and whole grains) was associated with a 7%to 19% lower mortality risk (Figure 2) (4). Overall, the authors believe that 9.3% of deaths in men and 7.6% in women in they study could have been prevented if all the individuals consumed fewer than 0.5 servings per day of red meat (4). Figure 2. 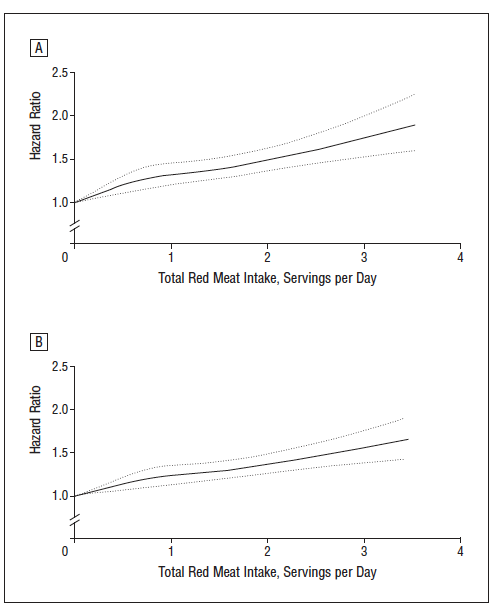 Hazard ratio in men (A) and women(B) as a function of daily red meat intake. Figure 2. Hazard ratio for protein alternatives to red meat. Overall, I am very supportive of this study. The large number of individuals that were involved in the study definitely adds to the robustness of the results. In conjunction with other studies that have identified the the carcinogenic effects of HAAs, this study confirms that red and cooked meats should not be part of a healthy diet. I think that one of the largest limitations of the study was their reliance on questionnaires. Because information on diet and lifestyle were self-reported, there is a major risk of bias, exaggeration, or omission. So even though the study was painstakingly thorough, we have to look at the results with a grain of salt. But even if the answers to the questionnaires were not perfectly accurate, it would be difficult to argue with a study that included so many individuals. During my research I ran into an article (5) that may be able to solve the questionnaire problem. Scientists are using biomarkers in hair to identify long-term exposure to HAAs. HAAs have been shown to bind irreversibly to melanin in hair. If this works, it will eliminate the problems with questionnaires. Researchers will no longer have to estimate HAA exposure (which can be tough because it varies greatly with cooking methods), but will instead have reliable data. I know that simply reading this blog will not lead you to drastically change your diet. In the same way that we are not going to wear long sleeve shirts at the beach, no one is going to completely stop eating meat. However, putting on sunscreen is a positive step! So, if you are eating meat cutting out the char will go a long way in reducing your risk of developing cancer. If you have any thoughts or questions, please feel free to comment! (1) Bakalar, Nicholas. "Risks: More Red Meat, More Mortality." The New York Times. The New York Times, 13 Mar. 2012. Web. 08 June 2012. <http://www.nytimes.com/2012/03/13/health/research/red-meat-linked-to-cancer-and-heart-disease.html>. (2) Turesky, R. "Formation and Biochemistry of Carcinogenic Heterocyclic Aromatic Amines in Cooked Meats." Toxicology Letters 168.3 (2007): 219-27. (3) Zheng, Wei, and Sang-Ah Lee. "Well-Done Meat Intake, Heterocyclic Amine Exposure, and Cancer Risk." Nutrition and Cancer 61.4 (2009): 437-46. (4) Pan, An et. al. "Red Meat Consumption and MortalityResults From 2 Prospective Cohort Studies." Archives of Internal Medicine 172.7 (2012): 555-63. (5) Alexander, J Et. Al. "Biomarkers of Exposure to Heterocyclic Amines: Approaches to Improve the Exposure Assessment." Food and Chemical Toxicology 40.8 (2002): 1131-137.